Calling all Big and Small customers especially toddlers and teens! Big & Small Group General Santos is now on Search for the next Junior Fashionistas. Here are the Mechanics and details of the Contest which I acquired from their friendly staff. This contest is open to cute customers of Big & Small Group GenSan. 1. Date: Contest period is from February 15 to April 30, 2012. Deadline of submission of entries is on March 15, 2012. All entries sent after the said date will not be included. 2. Eligibility: Open to all Big & Small Group GenSan customers’ ages 3 months to 16 years old. Ø Participants must fill out & submit the official entry form that can be downloaded through Big & Small Group GenSan fan page or get a copy from Big & Small Group GenSan store. Ø Take a trendy, cool and fashionable picture of your child wearing Big & Small, Orange Juice & Spin products that was purchased from our store beginning February 15 to March 15, 2012. Ø Contestants can only submit 1 entry. Ø Submit photo entry by E-mailing the picture file in JPEG format to bigandsmallgroupgensan@yahoo.com or hand it over to Big & Small Group GenSan store. Be sure to include the completed entry form and its requirements. 4. 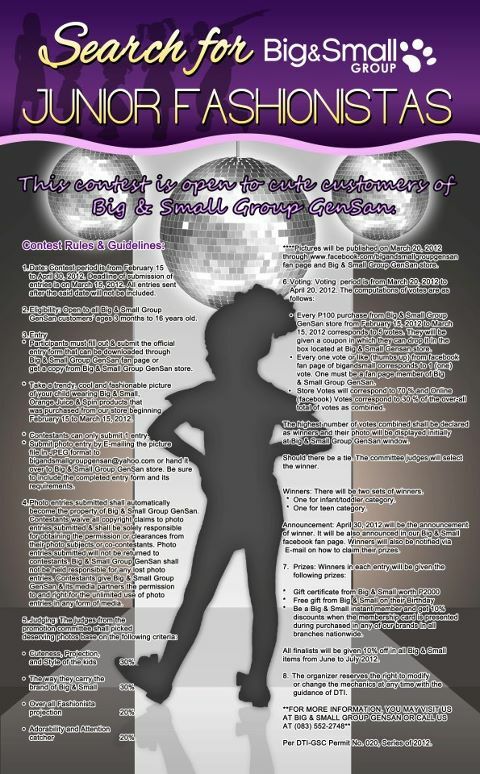 Photo entries submitted shall automatically become the property of Big & Small Group GenSan. Contestants waive all copyright claims to photo entries submitted & shall be solely responsible for obtaining the permission or clearances from their photo subjects or co-contestants. Photo entries submitted will not be returned to contestants. Big & Small Group GenSan shall not be held responsible for any lost photo entries. Contestants give Big & Small Group GenSan & its media partners the permission to and right for the unlimited use of photo entries in any form of media. ****Pictures will be published on March 20, 2012 through Big&Small Group General Santos fan page and Big & Small Group GenSan store. · Every P100 purchase from Big & Small Group GenSan store from February 15, 2012 to March 15, 2012 corresponds to 5 votes. They will be given a coupon in which they can drop it in the box located at Big & Small Gensan store. 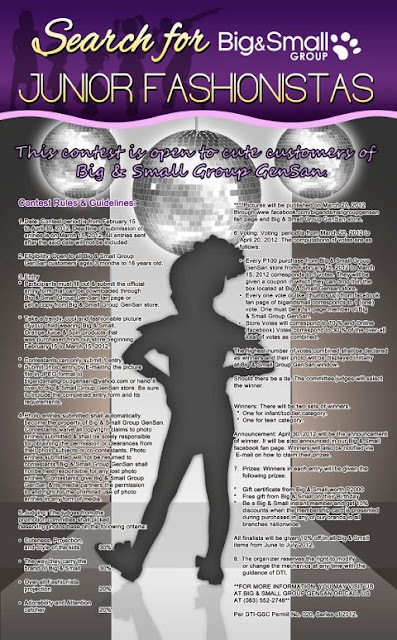 · Every one vote or like (thumbs up) from facebook fan page of bigandsmall corresponds to 1 (one) vote. One must be a fan page member of Big & Small Group GenSan. · Store Votes will correspond to 70 % and Online (facebook) Votes correspond to 30 % of the over-all total of votes as combined. The highest number of votes combined shall be declared as winners and their photo will be displayed initially at Big & Small Group GenSan window. Should there be a tie. The committee judges will select the winner. Winners: There will be two sets of winners. ü One for infant/toddler category. ü One for teen category. Announcement: April 30, 2012 will be the announcement of winner. It will be also announced in our Big & Small facebook fan page. Winners will also be notified via E-mail on how to claim their prizes. presented during purchased in any of our brands in all branches nationwide. All finalists will be given 10% off in all Big & Small items from June to July 2012. 8. The organizer reserves the right to modify or change the mechanics at any time with the guidance of DTI. So, what are you waiting for! Visit Big & Small Group GenSan now and bring along your children and shop at their wide variety of brands in kids and teen apparel. Indeed, being a "fashionista" applies to all ages!